There is a paucity of data on the amount of fluoride absorbed in humans from whole cooked food; especially a combination of different foods taken at regular meal times. The present study was thus aimed at estimating the amount of fluoride present and absorbed in humans from four regional representative meals viz. North Indian Vegetarian, North Indian Non-vegetarian, South Indian and East Indian. Twenty five healthy human volunteers aged 22-35 years participated in the study and each diet was tested on five volunteers. Each test diet was weighed into six equal parts, one part was kept for estimation of fluoride content and remaining five were given one each to the five test subjects in each of the four test diet groups. Eight hour plasma fluoride profiles were then studied after ingestion of weighed quantity of test diets and means calculated. The bioavailability of fluoride from these diets was evaluated in relation to that of sodium fluoride in solution form. The amount of fluoride estimated in different test diets varied between 1.53 - 10.0 mg. The bioavailability was found to be 1.6 per cent for north Indian vegetarian diet, 7.5 per cent for east Indian diet, 14.4 per cent for north Indian nonvegetarian diet and 31.7 per cent for south Indian diet, however, the amount of F(mg) absorbed in plasma from these diets was found to be low i.e. 0.06 mg, 0.75 mg, 0.72 mg and 0.48 mg respectively. An eleven year old girl reported to J. S. S. Dental College with spontaneous pain in the left mandibular region. On examination, left mandibular second premolar was found to be hypoplastic and grossly destroyed. On radiographic evaluation, an uncommon variation of bifurcation at the apical one third of the root was seen while the contralateral tooth was normal. Treatment planning included extraction of the tooth and evaluation of the morphodifferentiation which showed a webbed appearance in the bifurcated root contrary to the radiographic finding. This webbed appearance could be due to hypomineralisation due to trauma to the developing roots from the infection of its predecessors. This study was conducted on 30 extracted human primary molars to assess the retentive strengths of zinc phosphate, polycarboxylate and glass ionomer cements. The teeth were embedded in resin blocks and were randomly divided into 3 groups of 10 each. The occlusal surfaces of all teeth were reduced uniformly by 1.0 to 1.5 mm. All mesial, distal undercuts were removed and sharp angles rounded. This was followed by cementing pretrimmed and precontoured stainless steel crowns on each tooth with hand pressure and storing in artificial saliva at 37 degrees C for 24 hours. Retentive strength was tested using Instron Universal Testing Machine. The load was applied starting from a zero reading and gradually increased until the cemented stainless steel crowns showed signs of movement and then the readings were recorded. It was found that retentive strengths of zinc phosphate and glass ionomer cements were statistically better (P < 0.05) when compared to the polycarboxylate cement. Negligible difference (0. 59 kg/cm2) was however observed between zinc phosphate and glass ionomer cements. Tongue, because of its surface texture contributes significantly in plaque formation and accumulation, has remained a neglected part in the oral cavity. The study conducted on twenty students aged 18 to 23 years, was undertaken to clinically evaluate the role of supplementing tongue brushing to most advocated regime of tooth brushing. In both the phases of the study, plaque scoring was done daily and oral debris was collected on the eighth day. It was observed that tongue brushing when supplemented to the most advocated regime of tooth brushing that is, immediately after breakfast in the morning and immediately after dinner at night significantly reduced the initial rate of plaque formation and total plaque accumulation. Management of traumatic injuries to the teeth is a challenge to the practising dentist. It has no prescriptive method for occurring, possesses no significant predictable pattern of intensity or extensiveness and occurring at times when dentists are least prepared for it. It may not only leave physical scars but also a psychological impact on its victim. Yet, more than half of all children traumatize either their primary or permanent teeth before leaving the school, coupled with the dynamic panorama of sporting activity worldwide and the significant increase in violence among the populations. Tooth trauma and its management loom as a major challenge to the dental practitioner. A case of a 11 year old boy with Ellis Class 3 traumatic injury to the maxillary left central incisor is reported. A pulpectomy was performed followed by reinforcement and reattachment of the crown fragment and restoration with composite resin. 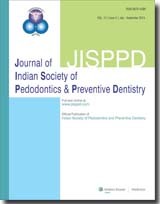 A study of prevalence and severity of dental caries was undertaken in seven nursery schools of Akola city in the age group of 5-6 years. A total of 508 children were examined out of which 288 were boys and 220 girls. The examination for dental caries and data collection was carried out as per W.H.O. (1987) criteria. Out of the total 508 children examined 61.41% were observed to be having caries with mean dmft/dmfs of 2.75+/-3.98 & 4.04+/-6.84 respectively. Total 17.91% school children were found to be having decay in either all upper or lower molars. In the high risk caries group 0.98% children were found to be affected with nursing caries and 0.2% children with rampant caries. Only a negligible proportion of filled teeth (1.42%) and missing due to caries (0.14%) was observed in the population. Occlusal surface caries was the most prevalent type of decay (44.71) and the mandibular deciduous second molars were the most affected by caries. Due to high prevalence of dental caries (61.41%) research must be carried out in the direction of identification of the children population at high risk of caries, so that a rigorous preventive programme be implemented. This epidemiological investigation was conducted on a sample of 3164 rural children aged 6-15 years in Raipur Rani and Naraingarh blocks in the district of Ambala in Haryana. 29. 2 percent of rural children were found to have malocclusion whereas 70.8 per cent had normal occlusion. Class I malocclusion was found to be maximum in 14.4 per cent of children, while malocclusion with class II molar relationship was observed in 13.5 per cent of children. Malocclusion with Class III molar relationship was seen in 1.3 per cent of the population studied. Three per cent of rural children were found to have abnormal oral habits, predominantly tongue thrusting and thumb sucking. The frequency distribution of abnormal oral habits in children with malocclusion was found to be 10.3 per cent.